As I got a bit older, I developed a keen interest in learning more about music and the history of the artists who created these wonderful treasures. I usually got my answers from reading album liner notes and asking my brother and his musician friends lots of questions. I would eventually learn that the song rooted in my head was credited to Freddie King and was originally recorded in 1960. And a year later would reach number 5 on the Billboard R&B charts and 29 on their Hot 100. The song was named after Mel’s Hide Away Lounge, a Chicago blues club frequented by many blues musicians of the era and adapted from a Hound Dog Taylor instrumental… Knowing that information, even back then helped my creative thought processes and heightened my appreciation for the music. My brother and his friends were rehearsing some songs from that particular album. The staging area in our house was crammed as they now added two sax players for a total of seven guys… It changed everything. The band was funkier, more soulful and the sound was bigger and bluesier than ever. They choose songs like “It’s Too Late, She’s Gone”, “Play It Cool” and of course “Hideaway.” If I didn’t know it already, I certainly knew it then; music was going to be a part of my life. But being so young, I still had plenty of time to figure things out. That was the atmosphere I was raised in for the first nine years of my life; a youthful observer just taking in all the creative energy of the time. I still find it challenging to put those feelings into words. One thing for certain, they will always remain great memories indeed! So how much did Freddie King play an influence on us? Well there’s only one word for that question… HUGE! was born in Gilmer Texas on September 3rd 1934. Freddie’s mother recognized her son’s early interest in music. At 6 years old Freddie began to learn rural country blues and his interests developed from there. His early music heroes were artists like Sam Lightnin’ Hopkins and Louis Jordan. King would play Jordan’s records continuously until he got the horn parts down note for note. In no time at all Freddie was finding his groove. After finishing high school the family moved to Chicago. Freddie was ecstatic! He was now living on the Southside of Chicago, the musical turf for Muddy Waters, Howlin’ Wolf, T-Bone Walker, Elmore James, Sonny Boy Williamson and so many blues greats. King would audition unsuccessfully for Chess Records. However it was a blessing as it forced King to continue finding his own unique style… Syd Nathan signed him to Federal in 1960 and his first session resulted in three hits “Have You Ever Loved a Woman,” “See See Baby” and the instrumental “Hide Away.” As I mentioned before, King’s career really took off in the early sixties, and in the process inspired several British blues artists that would later show their respect by having him open for many of their shows, or cover his songs on their records. Artists such as Led Zeppelin, Eric Clapton, and Jeff Beck are just a few examples. Shortly after Freddie King was sharing the spotlight in a serious way. The album Freddie King Is a Blues Master didn’t exactly sell great numbers, but it was a memorable album and a starting point for future discovery for me. Whenever I reflect on my personal relationship with the blues, I realize that King was responsible for that initial impression… He continued to tour even through health concerns and played at The New York Ballroom in Dallas just three days before passing away of heart failure on December 28th 1976. He was only 42 years old. Freddie King was a serious influence on many musicians of our time, including my older brother and his friends who would practice their craft inspired by his genius. It’s impossible to write one post covering King’s amazing and influential career. Perhaps that’s where you can help… Are you a Freddie King fan? Did any of his music inspire you? Were you aware that King would have turned 76 this September 3rd, 2010? Please add your comments below. Together we can discuss his wonderful legacy and perhaps share in some cool moments. 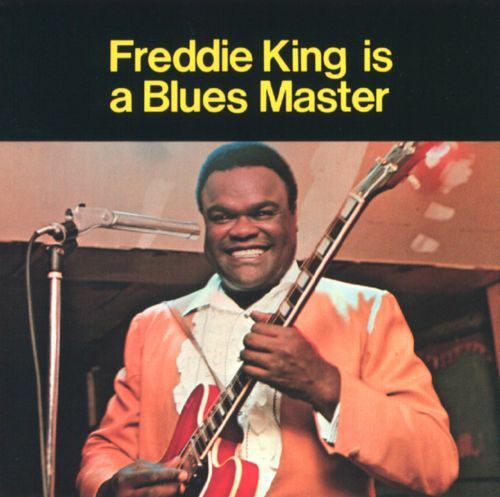 You certainly are right… “Freddie King Is A Blues Master”… but he did finally get “some” recognition… along with others that deserved their share too !! Sad thing was it took the guitar “legends” of the 60’s to say “Hey… these are the guys who got us… loving the blues” !! I guess that’s just the way it is… the “original legends”… getting out to the “masses” by the “new legends” who came much much later… in the “history of the blues” !! Great post Blues Blogger… thank you for sharing !! I didn’t know who he was! I’d heard him, and was amazed and had no idea who he was until reading this blog! So many blues legends,trail blazers are recognized late in life..its a shame….but its a bit like wisdom…i come with a price…and the marvel of that music/wisdom is now for us to appreciate…wonderful article here of a great bluesman…(Freddie King)…thanks for that…. Awesome! 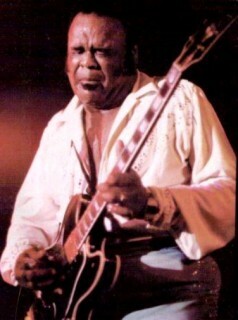 Freddie King eminates blues!He could be nothing other than a bluesman.His mastery of his guitar and his love for the blues is the icing on the cake.Have You Ever loved A Woman has never been done better or smother than Freddie.Thanks for the “taking me back home to the music I love” blog. I really enjoy listening to Freddie King’s music. He was awesome. Hope you and yours had a wonderful Christmas, and that you have an even better New Year. what a great blog!!! It’s it such a shame that many great blues musicians do not get the recognition thet desire until well after they are gone their music has done so much for the music world of today. Many musicians today credit their learning to greats such as Muddy Walters and Freddy King. Thanks for a great music lesson and wonderful videos of Freddy King may his legend live forever!!! I heard Clapton play Steppin Out on my Mono version of The first Bluesbreakers album, and just had to learn to play it that’s my favorite Freddy King number…he was a King alright..! Great post. 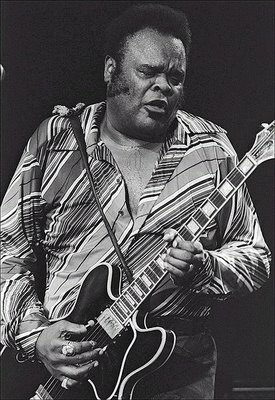 Freddie King was a true legend. Not only was his one of the best guitarists, but he had an amazing soulful voice. Thanks again BB. Freddie often played a tune called ‘I Love You More Everyday’. I want to record this song but a can’t until I find out who the songwriter was, who the publisher was, is this Freddie’s song… what??? I gotta pay the mechanical licencing fees to Freddie’s estate. I ‘ve sent emails numerous times through his website but nobody ever replies. I know this is an old request you made about ‘i love you more everyday’ but in case you still need to know, your best bet is to contact collectibles records, who have the reissue rights to all the King/Federal stuff, including that song.. I loved watching Freddie’s hybrid finger-style guitar work. The sound is great but the flexibility is amazing. His fingers seem to do the most amazing things. It’s as if they are always ready to do some picking technique that you can’t do with just a pick or traditional finger-picking. The stuff he came up with is so interesting and fun. Thanks for posting the video. Wow!